I still don't get it...and I doubt if I ever will. I'm of course referring to the latest bicycle craze (fad)...fixed gear, fixies...whatever you want to call them. I first blogged about my views of these bikes back in April...you can read it here. And as I stated in my earlier post on this subject...to be reasonable...I have never ridden a fixed gear bike (and have no plans to). I still believe it is a generational thing...I never see anyone under 25 on one. At any rate, the reason I bring this up again is because of what I saw today. I was riding the Mundo home fully loaded (see previous post...#56), and I was going at a pretty good clip...I'm guessing 10 mph. A guy on a fixed gear passes me so I pedal a little harder just to see if I could keep up (keep in mind this guy was probably half my age and his bike probably weighs 1/3 that of the Mundo...the Mundo clocks in at a hefty 62lbs. with nothing on it...I probably had it loaded with somewhere around 60 or 70 additional lbs.). Anyhow, not surprisingly I was able to keep up (undoubtedly because of the gears...being able to shift at inclines...I'm sure the momentum of all the extra weight didn't hurt either.). I followed him for about 1/2 mile and I thought to myself the same thing whenever I see someone on a fixed gear...don't you just want to coast ever once and a while? They have to keep pedaling non-stop. Anyhow, we came to an intersection and he tried to run the red light...luckily he saw an on coming car at the last minute. He must have been a "purest" because he didn't have brakes (some fixed gear riders...the smarter ones in my opinion...do use brakes). He pushed back hard on his pedals and was almost thrown over the handlebars the first time...his legs went flailing. On a second attempt, thankfully, he was able to do a series of short skid-stops. I, though, simply coasted the tank I was riding to a very gradual and comfortable stop. At a previous job I had a worked with some guys who were fixed gear advocates, and I would ask them to tell me a good reason why they rode them, and did they think they were safe. They would reply with comments like, "it's totally safe. man...you become one with the bike," or "the bike becomes an extension of one's self, dude." Well, this guy today almost extended himself right over the handlebars and became one with a car. I like my gears, I enjoy shifting and coasting...and am very conscious of the fact when I use them. I'll get off my little soapbox now. Hi, I like your blog, I read it from time to time, guess i missed the first post about fixed gear bikes though. I'm 32 and I ride fixed gear. no, but not all bikes are equal they all serve different purposes. you can't carry stuff on a state of the art carbon fiber road bike either. so you might not like fixed gear, might not understand them but there's space for all bikes for all tastes. I'm glad that you enjoy the blog...and that you enjoy riding. I agree with you that any bike that gets people riding is a good thing...including fixed gears. Keeping fit and short handlebars...that's a stretch. Any bike, if you ride enough, will keep you fit. And narrow "bull horns" will fit most bikes...not just fixies (actually, generally speaking, your handlebars should not be wider than your shoulders...if you can fit between cars so should your bike). My prediction is that when this fad wears off most riders will stay on bikes but gravitate towards those with gears...which I'm still convinced are more practical and useful. Thanks for blogging...keep on riding. Amen to this post. 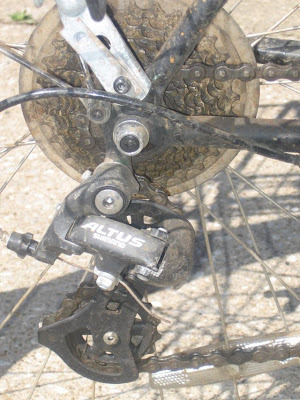 I cringe every time I see a vintage 10-speed butchered for the sake of this silly fad. I can understand why someone would not want 21+ speeds because there are only so many particular combinations that the typical rider will gravitate towards. But why not get a bicycle with a 3,5,7,8 speed internally geared rear hub? They are virtually indestructible and provide a good range of gear choices for urban riding.